Description Convert offset gathers to the angle domain. Go to the Process tab, click the "+" button and search for Angle Gathers. Click and provide a name for the Angle Gathers process. The type of gathers is automatically determined. If offset gathers are selected, the output sequence is set to angle. If angle gathers are selected, the output sequence is set to offset. Use the OFFSET header: offset values are provided by the OFFSET header. Calculate offset from SX/SY/GX/GY: offset values are calculated from the SX, SY, GX, GY headers (which honour the SCALCO header). Velocity volume: The velocity model to use when calculating ray paths through the gathers. If required, select the Velocity Type and Units as well. 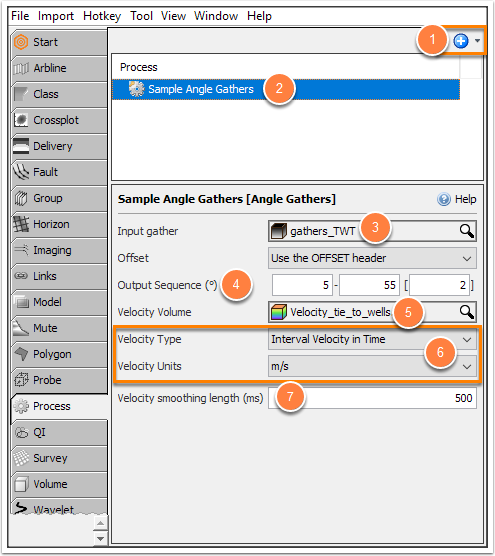 Velocity smoothing length (ms): Optionally apply smoothing to the velocity model before using in calculations.